Here’s a very short list of open source server software that I have found to run smoothly with an Oracle database back-end. All will work with the free Express Edition. While a bit of an overkill for a personal or small organization blog, Drupal is just about the only tool I have found that works well with an Oracle back-end. Combined with the right theme and an image gallery, it should also be able to run a photoblog. I really wish someone would adapt tools like Pixelpost and WordPress which both make it very easy to get a good looking site running. There was a project named orablog that looked promising, but appears to have been abandoned years ago. I was genuinely surprised by how easy it was to get up and running with phpBB on Oracle 11g XE. Whether you are small brochure style website or an elaborate e-commerce site, Drupal should be able to accommodate most or all of your requirements. Although a bit of an overkill, it can even be used for something like a personal blog or photoblog. Mediawiki which runs Wikipedia supports Oracle database. See my blog post on Installing MediaWiki 1.20.2 with Oracle 11g Express Edition to work around a couple of issues I had with the current release. I always meant to let my php scripts on my Ubuntu server access Oracle databases, thus quite possibly making it into a Linux, Apache, Oracle and PHP server. I do wonder how you would smoothly pronounce the resulting acronym. Anyway, I often have the feeling that open source systems and commercial databases are intentionally made to not play well together. Despite myself, I recently found a nice article on how to install Oracle 11g instant client and building php with support for OCI. The relatively simple instructions are for Ubuntu 10.04 but seems to work quite nicely on my Ubuntu 12.04 server. With any luck I’ll be pulling all sorts of interesting data from Oracle 11g using PHP before the end of the day. PHPOracle – Community Ubuntu Documentation. After deploying an Oracle Database Appliance, a standard set of production listeners are configured on bond0. This includes one listener on each of the virtual ip interfaces, and two SCAN listeners. In my environment, I would very much like to have additional listeners on bond1. I use this as a management network, and find it convenient to let DBAs and operators run their tools over this network. According to Oracle Support, there should not be any special considerations on ODA, and thus we can follow support note ID 1063571.1 just like we would with any other 11gR2 RAC infrastructure. The final step is to create the actual listener. Oracle reccomends that you do this with the network configuration assistant netca. The command must be run from the grid user. Just select Listener confguration and then Add and walk through the wizard, selecting the correct network resource (subnet) along the way. Note that netca sees the original listener on default port of 1521, and will not allow another on the same port. I went with a name of LISTENER_M and a port of 1522 for my configuration. This will take care of both listener.ora and OCR configuration. However, I really do want the new listener to be listening the default port of 1521. netca complains that another listener is already configured on this port, even though it’s not on the same interface. The workaround is to manually remove and recreate the listener with srvctl using the -s option. We’re all set, and can now see the new listener (along with the default listeners) on the correct interface and port using netstat. As you can see, the listener is up but supporting no services. Unless we want this to be a static listener, we need to tell the database to make it’s presence known. We accomplish this by using the new LISTENER_NETWORKS parameter. Service “TESTDB” has 2 instance(s). With the introduction of Oracle Engineered Systems the DBA is moved somewhat closer to infrastructure design decisions, and expected to at least have some opinions on the network design requirements for the database. 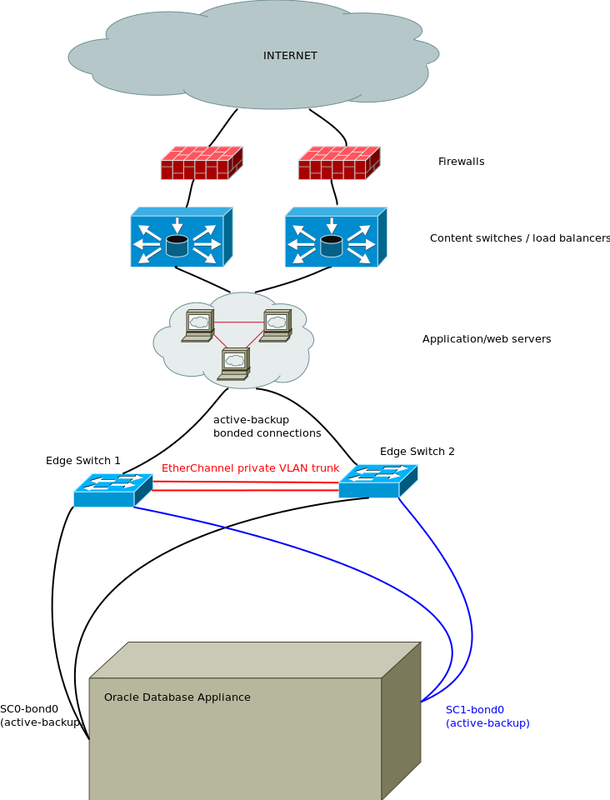 As such, I’ve given some thought to how one can design a fully redundant production network for web applications with Oracle Database Appliance. I’m sure Oracle have some very clear ideas on how everything is meant to work together, but to me it was not all that clear. For a time, and even after reading all documentation and support notes related to ODA, I was convinced that the bonded interfaces meant setting up LACP or EtherChannel groups on the switches, thus requiring fully redundant distribution or core-level switches. As it turns out, the ODA is factory configured with active-backup bonds. I’ve tested this to work well without any switch-side LACP/EtherChannel configuration, and each bonded connection may be split across two switches. In my tests, no simulated failure or network reconfiguration caused more than a a few hundred milliseconds worth of network outage. This means that one can set up an isolated redundant front network for web applications using any layer two switches that are not inherently redundant. To avoid client connections taking the long way into the company network and back through the other switch (and thus making production dependent on that equipment), one can have a private VLAN that only lives on the two edge switches and on an EtherChannel trunk between them. As such, only the application servers and the database appliance will exist on that virtual network segment. I don’t see a way to control which path the connections from the application servers take to the database listeners, so the link between the two switches will have to be redundant, less this link becomes a single point of failure. This rules out using unmanaged switches without support for VLAN and either LACP or STP. Using Cisco Catalyst 2960-series switches, I believe a combination of EtherChannel and Port Fast would be the better choice for a solid independent connection between the two. I would also use Port Fast on the ports for all the bonded connections to ODA and application servers. Since the production network is isolated, one would need separate network connections for management, backup and connectivity to the rest of the company network. Naturally, in order for this front production network to be fully self contained, any dependencies to external resources, such as DNS or authentication services, must also be resolved. Ideally production would be able to continue independently from any faults, ongoing maintenance or network outages anywhere else in the data center or company network. In a previous article I looked at how one could force imp to place user objects in the default tablespace of a user, in cases where the originating tablespace was not available in the destination database. The newer Oracle Data Pump utilities, expdp and impdp provides a remapping option that lets you migrate data to a new tablespace during import. Data Pump was made the preferred way of doing imports and exports in Oracle 11g. Data Pump reads and writes data to a directory on the database server, so the first thing we must do is define such a directory on both source and destination databases. The directory must be acessible by the oracle database. As soon as we have transferred the dump file /u01/dpxfer1/dbuser.dmp to the destination server, we’re ready to run the import with the REMAP_TABLESPACE option, in this case placing any objects from the USERS tablespace on the source database into the DBUSER table space on the destination database. Naturally the user and table space must already exist on the destination, and the data pump directory as well as the associated user privilege must be added just like we did on the source database. In the old days, it was common to store objects from assorted users in the USERS tablespace. In more modern days, it sometimes seems more appropriate to store user objects in a tablespace dedicated to that schema. So, as I was transferring data to a new Oracle server, I found myself wishing to import data into a different tablespace than on the source database. While the impdp tool includes a remap option to take care of such a scenario, the traditional imp tool does not. A workaround is to force all user objects into the default tablespace of that user, however this only works if the source tablespace does not exist. As an example, I have a user blog_data on OLDDB with it’s objects (in this case, a single table with a single row, and the associated primary key index) stored in the users tablespace. Documentation for odachk is now available on My Oracle Support. The documentation for Oracle Database Appliance Configuration Audit Tool is now available on My Oracle Support note 1485630.1. When I failed to find any documentation on the ODA version of the tool, I contacted Oracle who then created the above mentioned note with the odachk User Guide attached. After some tinkering on my filer, I once again found myself looking for a simple tool to check the performance of a network share under Windows (SMB/CIFS). The usual disk benchmark tools such as Crystal DiskMark and AS SSD benchmark typically only works for local block devices. Of course, now I need to work out why the filer’s external storage performs rather poorly over the network, and possibly how to improve on the situation.